The Federal Reserve has initiated what appears to be sustained, incremental increases in the Federal Funds rate and by extension other interest rates. Current expectation is for a ¾ to 1 percentage point increase in 2018, after a ½ percentage point increase in 2017. Impact of increasing interest rates on cropland prices has become a topic of interest. Recent discussions include a USDA (U.S. Department of Agriculture) report (Burns and colleagues) and a 5-article issue of Choices, an outreach publication of the Agricultural and Applied Economics Association. This article continues the discussion. Using the simple asset capitalization formula, it finds that, since 2003, the increase in land rent is twice as important as the decline in interest rates in explaining higher cropland values. 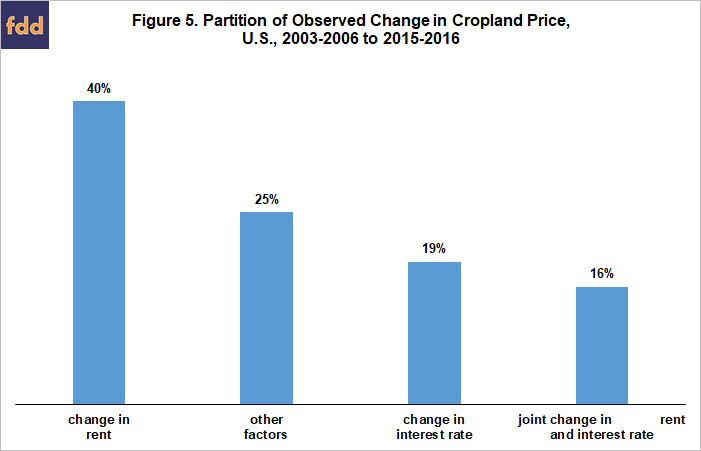 While increasing interest rates clearly create downward pressure on cropland prices if all other factors remain constant, the latter is rare. Other factors, especially rent, can either reinforce or offset the bearish tilt of higher interest rates. Interest rate is an important but far from an all-determining explanation of cropland prices. Many factors affect the value of cropland, but the core factors are rent (annual earnings) and interest rate. A simple procedure to examine their impact is to compute the capitalized value of cropland. In its simplest version, capitalized value equals rent divided by interest rate expressed as a decimal value (see Sherrick, and Schnitkey and Sherrick for an extended discussion of capitalization). This article examines the role of interest rate and rent in explaining the change in cropland values between 2003-2006 and 2015-2016. These 2 periods bracket the recent period of farm prosperity and have similar ratios of market return at harvest to total cost of production for the 9 crops that USDA publishes production cost (Zulauf and colleagues). The specific data used in this article are the farm real estate interest rate reported quarterly by the Federal Reserve Bank of Kansas City and the per acre price of cropland and cash cropland rent reported annually by USDA, National Agricultural Statistics Service. Between 2003-2006 and 2015-2016, average interest rate on farm real estate loans declined roughly 2 percentage points, or by 28% (see Figure 1). Concurrently, average cash rent of U.S. cropland increased by $63/acre, or by 82% (see Figure 2). Thus, rent increased proportionately more than interest rate declined between the 2 periods that bracket the recent period of farm prosperity. The 2003-2006 average rent and interest rate generate a capitalized cropland value of $1,056/acre ($77/0.0727) (see Figure 3). For 2015-2016, capitalized value is $2,672/acre ($140/0.0524), or $1,616/acre higher. Individual impact of higher rent and lower interest rate can be assessed by assuming the other factor stayed at its 2003-2006 value. 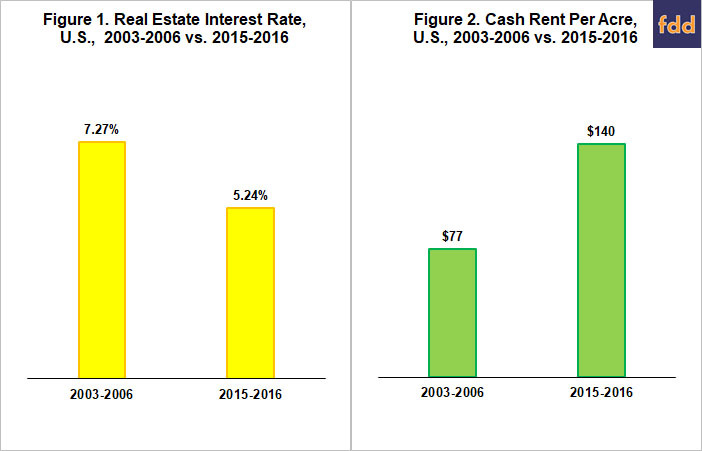 Keeping rent at its 2003-2006 value, the decline in interest rate increased capitalized value by $409/acre ($1,465 – $1,056) (see Figure 3). Keeping interest rate at its 2003-2006 value, the increase in rent increased capitalized value by $870/acre ($1,926 – $1,056) (see Figure 3). The lower interest rate had less than half the impact of higher rent. The remaining increase in capitalized value of $337/acre ($1,616 – $409 – $870) reflects the joint impact of lower interest rate and higher rent. The simple capitalization formula is useful, but rent and interest rate are not the only factors affecting cropland values. Among the other factors are inflation, growth in land productivity, time structure of interest rates, farm cash reserves, nonfarm use of farmland, and measurement error of interest rate and rent. Importance of the other factors as a group can be assessed by comparing the capitalized value reported in Figure 3 with the value of cropland reported by USDA. The USDA value exceeded the capitalized by 84% in 2003-2006 and by 54% in 2015-2016 (see Figure 4). Thus, in both periods the other factors as a group added value to cropland beyond that attributed to the simple capitalized value. 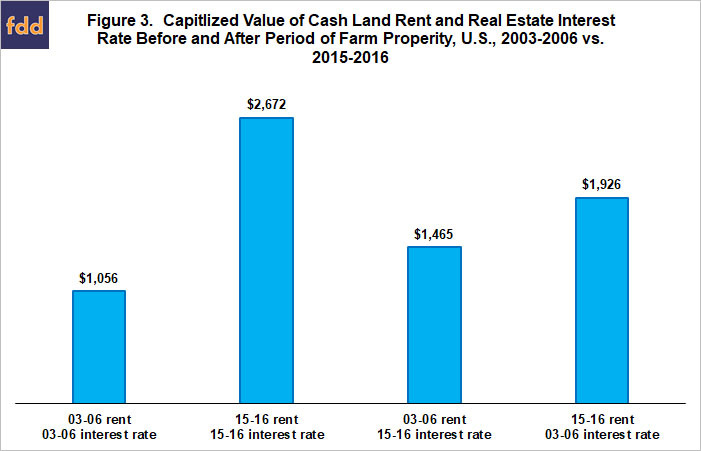 Based on the values calculated in the 2 preceding sections, the change in capitalized value due to an increase in rent equals 40% of the USDA reported change in land value from 2003-2006 to 2015-2016 (see Figure 5). Change in capitalized value due to a lower interest rate is 19% of the observed change in land value. Joint effect of higher rent and lower interest rate and the residual due to all other factors are 16% and 25%, respectively, of the observed change in cropland value. 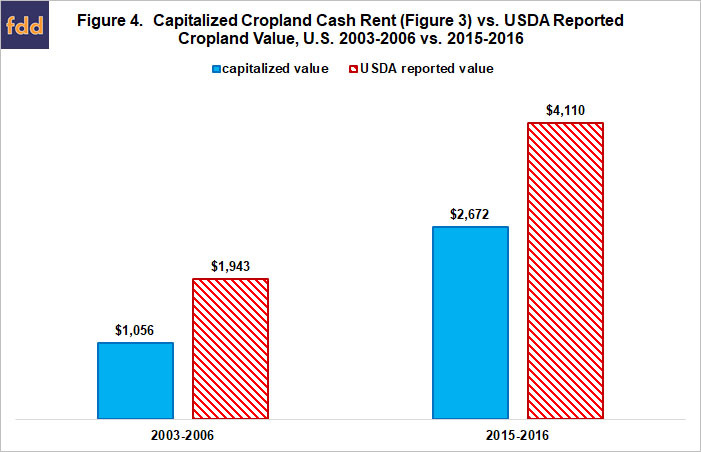 Assuming rent stays at its 2015-2016 level, a 2003-2006 interest rate of 7.27% generates a capitalized cropland value of $1,926/acre compared with the $2,672/acre capitalized value for 2015-2016 (see Figure 3). However, other factors, such as higher rents, may blunt the bearishness of higher interest rates. In addition, combined impact of the other factors was proportionately more during 2003-2006 than during 2015-2016 (see Figure 4 and discussion in the “Other Factors” section above). Thus, returning to the 2003-2006 impact of the other factors would also blunt the bearishness of higher interest rates. The simple capitalization formula suggests higher land rents were twice as important as declining interest rates to the increase in cropland prices between 2003-2006 and 2015-2016. The simple capitalization formula also suggests a return to the 2003-2006 real estate interest rate, which is roughly 2 percentage points higher than the current rate, would reduce cropland price by approximately 30%, assuming no change in land rents and no change in all other factors that influence land prices. Higher interest rates clearly generate headwinds for cropland values and increase risk for cropland buyers, owners, and lenders. However, other factors, notably rent, are important for cropland values. Especially if rents do not decline, the decline in cropland values resulting from higher interest rates may cause cropland prices to retrace well less than half of their increase since the early 2000s. On the other hand, a decline in rents while interest rates are increasing would catalyze a steeper decline in cropland values. It is important to watch interest rates but also important to watch rent and other factors that impact cropland prices, and in particular are the three sets of factors reinforcing each other or offsetting each other. Burns, Christopher, Nigel Key, Sarah Tulman, Allison Borchers, and Jeremy Weber. Farmland Values, Land Ownership, and Returns to Farmland, 2000-2016, ERR-245, U.S. Department of Agriculture, Economic Research Service, February 2018. Zulauf, C., G. Schnitkey, J. Coppess, and N. Paulson. “U.S. Field Crop Income – Return to Normalcy.” farmdoc daily (8):50, Department of Agricultural and Consumer Economics, University of Illinois at Urbana-Champaign, March 21, 2018.